5 days is all it took for me to send an email to a potential business coach and then sign up with them â€“ agreeing to the biggest investment EVER in my 2-year-old agency biz. How much was this investment, you ask? $1,000 a month for 4 months. But at the time I was eager. And ready to do the damn thing! At that time, I had grown my personal Instagram account to about 20,000 followers. I knew there was potential to do something there â€“ I just didnâ€™t know what exactly. In the back of my mind, I had a dream of becoming an online course creator. 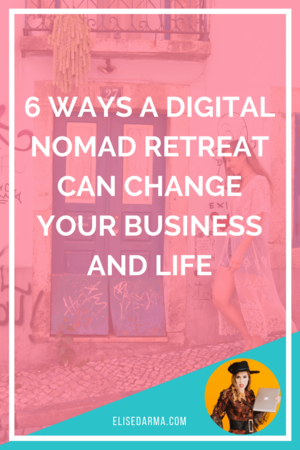 To teach others what I had learned for myself over the past 2 years of being an agency owner and full-time digital nomad. So when someone recommended a few business coaches in a Facebook group one day, I checked them all out, sent off a few inquisitive emails and within 5 days, I had my very first business coach. I loved her straight-talkinâ€™ energy and her crazy-smart business acumen. However, I learned a powerful lesson in my first-ever experience with a business coach. Where she had scaled her business toâ€¦ I did not want to take my business to. She was an expert in building a jam-packed agency business. But I wanted to launch and create an online course. Our objectives were not always aligned. Youâ€™re getting a super exclusive sneak peekâ€¦ at my first ever website. Yes - youâ€™re thanking my business coach now, too, right? Very first video and promo for my first live webinar everâ€¦ 2 whole years ago! When you choose a business coach, you need to pick one that has designed a business EXACTLY how you see yours evolving. Want to book out your client-based business? â†’ Book a coach who successfully does that. Want to sell evergreen online products? â†’ Hire a coach who has mastered the art of evergreen and is reaping the profits. Want to offer high-end consulting to corporate clients? â†’ Hire a coach whose business is built off of that very foundation. Okay, maybe you don't NEED a business coach, but in my humble opinion, it's one of the best investments you can make. As freelancers and business owners, an outsider's perspective can shake things up in a good way. A good business coach will help you mold your business around your life (and not the other way around), hold you accountable, and will help to keep you on track. Okay, so what are the benefits of working with a coach? Here's how to find a business coach that's going to help you navigate the online world and be the perfect fit for YOU. You're not going to find the right coach if you don't understand your business and where you want to go. Where is my business RIGHT NOW? The good, the bad, the ugly. What SKILLS do I need to learn to achieve my goals? When I decided to grow my agency business through e-products, 1-on-1 coaching and educational trainings, I had gaps of knowledge that were holding me back. Baby Elise with my Baby Business back in the confused old daysâ€¦ probably emailing my biz coach to ask about sales funnels. Iâ€™ve learned so much since then that Iâ€™m now helping OTHERS set up their sales funnels; oh, how the tables have turned! So I made sure I hired a business coach who had been in my shoes, had all those advanced skills and could show me what steps I needed to take... to make my business successful. Once you've signed up for a trial or discovery session, treat it like a job interview. In that, youâ€™re interviewing the coach. Use the session as an opportunity to mine for information to find out everything you can about their coaching style, any particular business practices, and anything else that may impact the success of the partnership. What's your current business model? What are your coaching hours? What are some things that youâ€™ve helped your previous clients with and how did you help them? These questions will give you a good basis to understand how that coach runs their business. You'll find out if they are super hands-on or if they have a more independent approach. How many hours they work will give you an indication of their business philosophy and what shortcuts they can teach you. Don't be scared to get into the nitty-gritty details. If you're just starting your biz and you have a young family or a full time job, you need someone who can understand the constraints on your time. There is HUGE value in hiring a coach that has the lifestyle you want to achieve. Before you sign a contract, test the coach out. Even if they have amazing testimonials, you still need to dip your toes in and get a sample of their work. Donâ€™t be like me in this photo and run into the roaring ocean with no regard for anything; always dip one toe in to test the waters first. Good advice for going to the beach AND making big business investments! ðŸŒŠ Youâ€™re welcome. One of the best ways to do this is to sign up for one of their free training sessions, any live online webinars, or one of their previous workshops. Will I enjoy working with them? Does their style resonate with me? Do I feel like weâ€™re speaking the same language? If you can answer yes to these questions without any doubts, you're one step closer to picking the right business coach for you. Is a business coach ticking all of the boxes for you, but something doesn't FEEL quite right? Don't write off your gut feeling. Listen to your intuition and continue the search. You want to work with a coach that's going to make you feel excited every time you have a call. You want that electric synergy that's going to inspire you and impact your results. Donâ€™t monkey around and hire just any business coach. Investing in a business coach is not the same as signing up for an online course about Pinterest or time management hacks. It's an investment in yourself and in your dreams, so trust your instincts. Whether you're seeking expertise, accountability or someone to help you get out of your own head, choose the best person for where your business is at right now. Don't feel bullied into making a decision, either. It's your biz, and you hold all the power â€“ not the coach. With that being said, if youâ€™re in a situation where your gut feeling is holding you back, take some time to assess whether itâ€™s the coach or YOU. Sometimes fear has a funny way of creeping into our lives. Itâ€™s totally normal to feel it when youâ€™re about to embark on a new adventure or a new investment. Donâ€™t confuse your fear of the unknown with the conclusion that this is the wrong coach for you. In fact, the right coach will be able to recognize that this is where youâ€™re at and help you through itâ€¦ so that you can ultimately make the best decision for yourself. My 1-On-1 Business Coaching Is Closing Soon! If youâ€™re reading this blog post because youâ€™ve secretly been watching me from the sidelines and are considering hiring me as *your* coach, I have news for you. But my 1-on-1 Mind The Gap coaching program will be shutting down as of January 2019. Whether itâ€™ll open back up again at some pointâ€¦ I donâ€™t know. So this is your sign (if youâ€™ve been waiting for one). Make sure to bring them to our call! Canâ€™t wait to meet and chat.